My almost three year old loses focus as she gets tired which can make the nap and bedtime routines a challenge. I made up a quick and easy to do list to help keep her on track. It’s not super pretty, but it’s working for us, which is all that matters in the end. My first step was to search the web (using Swagbucks, of course) for chore charts to see what sorts of options other clever people have devised. Any promising candidate I pinned to a Pinterest board so I could later view all the ideas in one place and pick and choose what might work for us. I must say, there are some really beautiful chore charts out there. When my daughter gets older, if chores become a struggle, we may make something pretty together. Quick and cheap to make. I didn’t want to invest a lot of time or money in this venture since I don’t expect to need the board long term. Graphics for the tasks. Since my daughter can’t read yet, I needed illustrations. Some charts are better suited to words. Easy to add/delete tasks and to use for naptime vs. bedtime. Quick to reset for the next day. Easy for my child to change the status of items from to-do to done. Easy to bring with us to the site of the next task. I didn’t want my daughter to have to go running back to, say, the refrigerator, after every task. My solution: a cookie sheet, some magnets, a task list printout for naptime, and a task list printout for bedtime. All the magnets start at the bottom of the page. 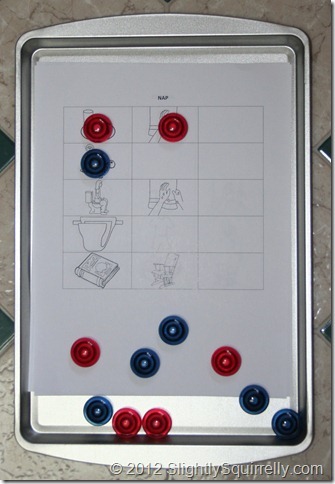 The magnets are used to cover the tasks as they are completed. 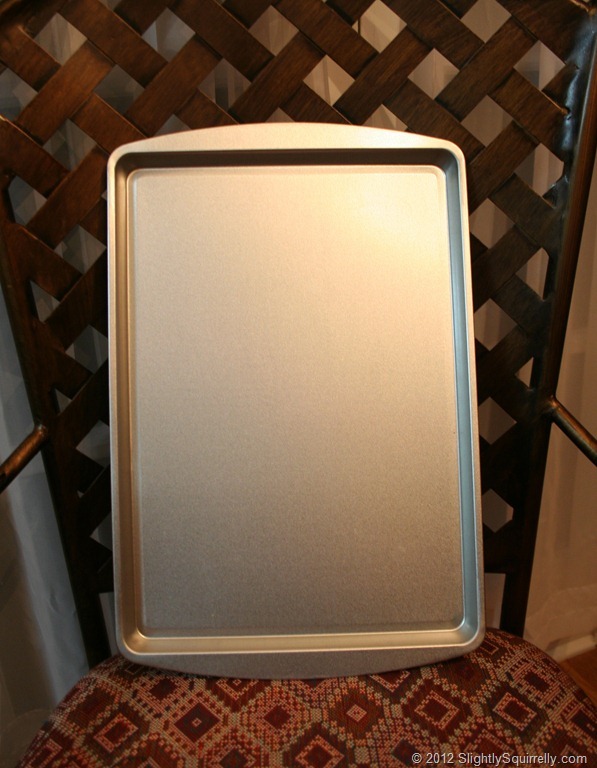 I got the cookie sheet idea from the homework center tutorial at Coupons Are Great. 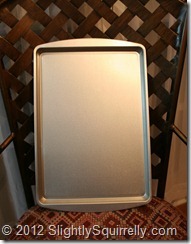 My cookie sheet came from the Dollar Tree, but CAG reports that Wal-Mart sells it for $0.92. I left mine unpainted so that if the board failed to keep my daughter on track, we could reuse the cookie sheet for cooking or play cooking. The task sheets were made in Microsoft Word. I made a table and inserted the images. I resized all the images to 1.2 inches high. The majority of the task images came from do2learn. I used Google to do an image search to find the rest. I restricted my results to “line drawing” so all the images would have a similar look. The magnets were actually the hardest element to find. 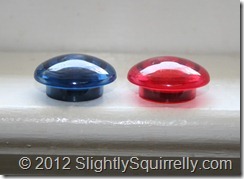 I wanted something about an inch in diameter, preferably pretty colors. 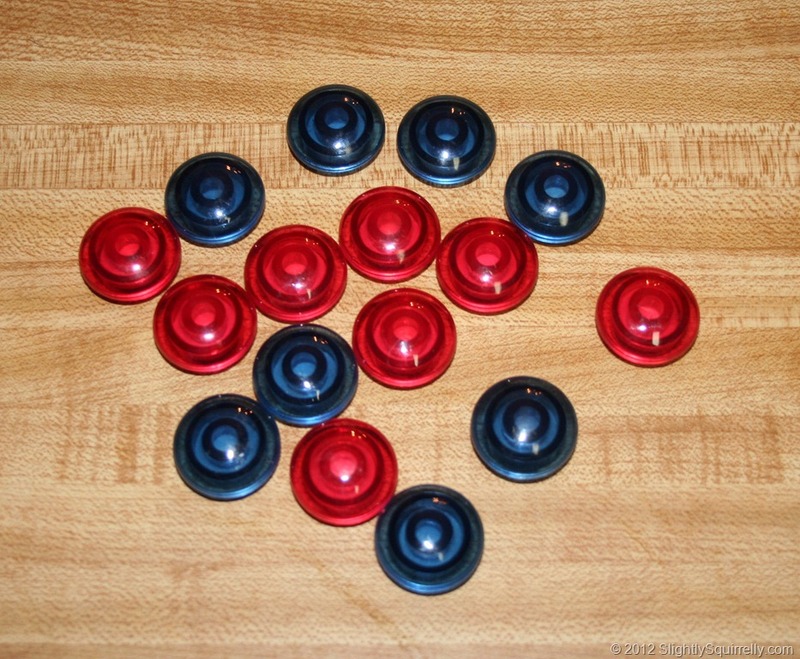 I thought about making my own, but in the end, I stumbled across these 1-inch round magnets, which are perfect, in the clearance bin. 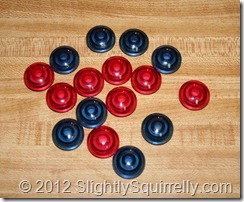 I love the mushroom shape because it makes them so easy for little fingers to grab and move. Originally, I had three colors of magnets. I thought that letting her choose what color magnet to use to cover the task would be an easy way to let my daughter feel like she had some control. However, it became a negotiation with each new magnet placement. 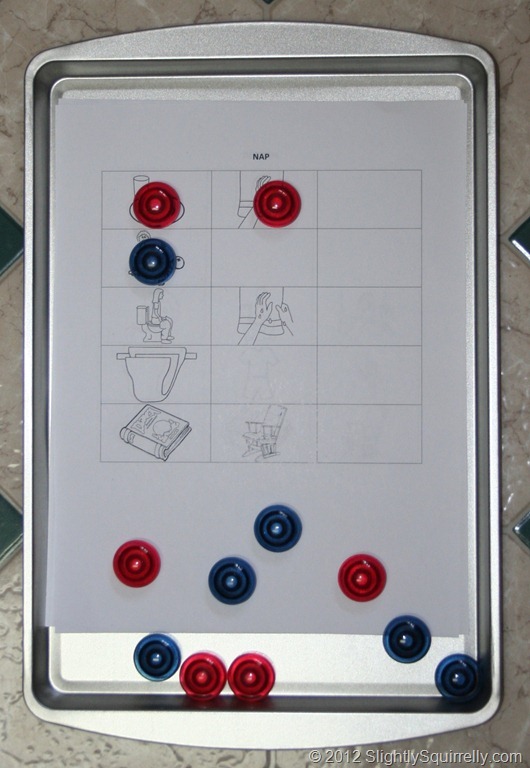 For example, the newly completed task had to be blue (who knows how the toddler mind works), but she was out of blue so the blue magnet would be taken off a previous task and replaced with a pink. There’s still a little negotiation with two colors, but it’s manageable. When it’s time to start the other sheet of tasks, I just slide all the magnets down to the bottom of the cookie sheet, swap pages, and stick a magnet on the page to hold it. Simple as it is, this board has made things go a lot more smoothly. I hated saying no to requests for “one more book”, but this board has put an end to those requests at nap/bedtime. Of course, requests for “one more book” are almost always honored at other times during the day. This entry was posted in Kid-related, Organization and tagged bedtime routine, chore chart, kids, magnetic board, magnets. Bookmark the permalink.